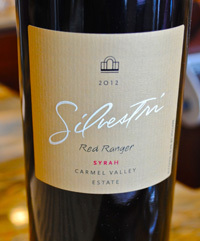 2012 Silvestri, Syrah “Red Ranger” Estate, Carmel Valley. One of the best reds from Carmel Valley is Alan Silvestri’s estate Syrah, and this reserve or barrel selection called the Red Ranger, especially good in this vintage and noticeably more distinct than the normal estate bottling. Silvestri is and was inspired by the wines of the northern Rhone Valley of France and I know personally he studied extensively many a Cote-Rotie, Hermitage and Cornas! When he planted his tiny Carmel Valley estate vineyard there were not many that went to way of Syrah, but he has put out some very good wines and I really love what he has done with both these Syrah and the new planting of Barbera. The 2012 Silvestri Red Ranger Syrah is rich and dense, but still with nice acidity and reliable tannins showing plenty of vigor and structure, there is a hint of floral and pepper notes on the nose leading to damson plum, meat and kirsch along with blueberry, boysenberry and earth on the palate while there are hints of anise, cedar, bacon and tangy currants. There is a good opening and evolution in the glass with air, this wine is still wound up and young, and when mature it will reveal more cassis, mocha and earthy tones, with a slightly chalky/mineral note in the background, this is solid impressive stuff, drink from 2015 to 2019.